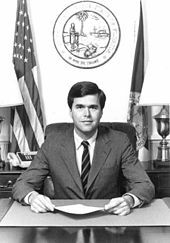 In 1996, The Foundation For Florida's Future published a book that Bush had co-written, Profiles in Character (ISBN 0-9650912-0-1), a clear parallel to John F. Kennedy's 1955 book Profiles in Courage. 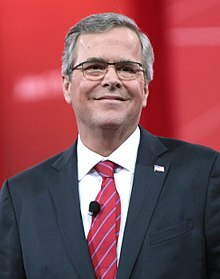 The foundation also published and distributed policy papers, such as "A New Lease on Learning: Florida's First Charter School", which Bush co-wrote. 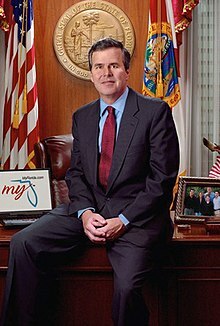 Bush subsequently wrote the foreword to another book, published by the conservative Heritage Foundation and written by Nina Shokraii Rees, School Choice 2000: What's Happening in the States ( ISBN 0-89195-089-3). ^ "The Other Bush on Taxes". CNN Money. Retrieved August 28, 2015. ^ Kleindienst, Linda. 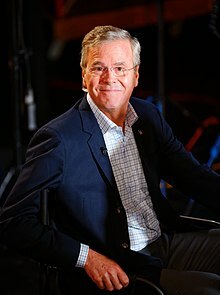 "The Jeb Bush Era Ends in Florida". Washington Post. Retrieved August 28, 2015. 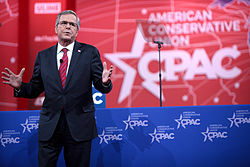 ^ "Jeb Bush's Personal Investments Are as Messy as His Suspended Campaign". Money. Retrieved December 1, 2018. ^ Staff, TIME. "Jeb Bush Drops Out of Presidential Race". TIME.com. Retrieved February 21, 2016. ^ Parker, Ashley (January 5, 2016). 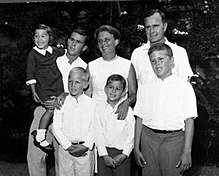 "Jeb Bush Drops Guard to Share Family Account of Addiction". New York Times. Retrieved February 13, 2019. ^ Shaban, Hamza (April 21, 2018). "'The first lady of the greatest generation': Barbara Bush honored by friends and family at private funeral in Houston". Washington Post. ISSN 0190-8286. Retrieved April 21, 2018. 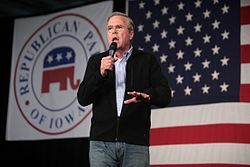 This page is based on the Wikipedia article Jeb Bush; it is used under the Creative Commons Attribution-ShareAlike 3.0 Unported License (CC-BY-SA). You may redistribute it, verbatim or modified, providing that you comply with the terms of the CC-BY-SA.